Click on the above map to be able to read it. The original of the map is here. Tito had a post yesterday here with a map depicting how America views Europe. Ambrose “Bitter” Bierce in the 19th Century said that war was God’s way of teaching Americans geography. Unfortunately, the lessons do not appear to stick. However, the Europeans are often not that better informed about us. For example, I have always enjoyed reading the English historian Paul Johnson, and have read almost every book he has written. Therefore, I was dismayed when reading his history of the US to encounter quite a few factual errors, including his inability to distinguish between Albert Sydney Johnston and Joseph Johnston in the Civil War, and his apparent belief that it was the Texas Rangers and not Army Rangers who landed at Utah Beach on Normandy. European views of America can be just as much based upon rank ignorance and stereotypes as Amerucan views of Europe, as the American writer Bruce Bawer discovered after living in the Netherlands and Norway. America, in short, is a mess—a cultural wasteland, an economic nightmare, a political abomination, an international misfit, outlaw, parasite, and pariah. If Americans don’t know this already, it is, in Hertsgaard’s view, precisely because they are Americans: “Foreigners,” he proposes, “can see things about America that natives cannot. . . . Americans can learn from their perceptions, if we choose to.” What he fails to acknowledge, however, is that most foreigners never set foot in the United States, and that the things they think they know about it are consequently based not on first-hand experience but on school textbooks, books by people like Michael Moore, movies about spies and gangsters, “Ricki Lake,” “C.S.I.,” and, above all, the daily news reports in their own national media. What, one must therefore ask, are their media telling them? What aren’t they telling them? And what are the agendas of those doing the telling? Such questions, crucial to a study of the kind Hertsgaard pretends to be making, are never asked here. Citing a South African restaurateur’s assertion that non-Americans “have an advantage over [Americans], because we know everything about you and you know nothing about us,” Hertsgaard tells us that this is a good point, but it’s not: non-Americans are always saying this to Americans, but when you poke around a bit, you almost invariably discover that what they “know” about America is very wide of the mark. In any event, The Eagle’s Shadow proves to be something of a gyp: for though it’s packaged as a work of reportage about foreigners’ views of America, it’s really a jeremiad by Hertsgaard himself, punctuated occasionally, to be sure, by relevant quotations from cabbies, busdrivers, and, yes, a restaurateur whom he’s run across in his travels. His running theme is Americans’ parochialism: we “not only don’t know much about the rest of the world, we don’t care.” I used to buy this line, too; then I moved to Europe and found that—surprise!—people everywhere are parochial. Norwegians are no less fixated on Norway (pop. 4.5 million) than Americans are on America (pop. 280 million). And while Americans’ relative indifference to foreign news is certainly nothing to crow about, the provincial focus of Norwegian news reporting and public-affairs programming can feel downright claustrophobic. Hertsgaard illustrates Americans’ ignorance of world geography by telling us about a Spaniard who was asked at a wedding in Tennessee if Spain was in Mexico. I once told such stories as well (in fact, I began my professional writing career with a fretful op-ed about the lack of general knowledge that I, then a doctoral candidate in English, found among my undergraduate students); then I moved to Europe and met people like the sixtyish Norwegian author and psychologist who, at the annual dinner of a Norwegian authors’ society, told me she’d been to San Francisco but never to California. Living in Europe, I gradually came to appreciate American virtues I’d always taken for granted, or even disdained—among them a lack of self-seriousness, a grasp of irony and self-deprecating humor, a friendly informality with strangers, an unashamed curiosity, an openness to new experience, an innate optimism, a willingness to think for oneself and speak one’s mind and question the accepted way of doing things. (One reason why Euro- peans view Americans as ignorant is that when we don’t know something, we’re more likely to admit it freely and ask questions.) While Americans, I saw, cherished liberty, Europeans tended to take it for granted or dismiss it as a naïve or cynical, and somehow vaguely embarrassing, American fiction. I found myself toting up words that begin with i: individuality, imagination, initiative, inventiveness, independence of mind. Americans, it seemed to me, were more likely to think for themselves and trust their own judgments, and less easily cowed by authorities or bossed around by “experts”; they believed in their own ability to make things better. No wonder so many smart, ambitious young Europeans look for inspiration to the United States, which has a dynamism their own countries lack, and which communicates the idea that life can be an adventure and that there’s important, exciting work to be done. Reagan-style “morning in America” clichés may make some of us wince, but they reflect something genuine and valuable in the American air. Europeans may or may not have more of a “sense of history” than Americans do (in fact, in a recent study comparing students’ historical knowledge, the results were pretty much a draw), but America has something else that matters—a belief in the future. Go here to read all of Bawer’s essay. Americans have much to learn from the rest of the world, just as the rest of the world has much to learn from America. This entry was posted on Monday, October 4th, 2010 at 5:30am and is filed under Uncategorized. You can follow any responses to this entry through the RSS 2.0 feed. Both comments and pings are currently closed. That map has way too much detail in it. Either they are red states or they’re in various states of ruin. I have to jump on the band wagon about there being much to much detail for a European. 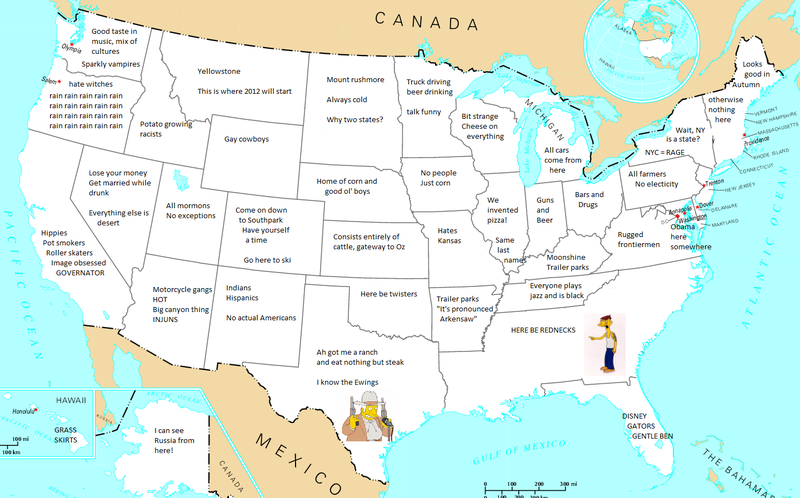 That’s more a Map of how American’s see our own country, allowing for everyone to have more knowledge of their own state of course. Some of these are a bit puzzling: “Same last names” in Illinois? Ohio is all bars and drugs (I would think “Burning Rivers” is more evocative)? 2012 starts in Montana? My freshman dorm roommate came from Maryland to northern California for college. I still remember the hand-drawn “bon voyage” poster someone had drawn him, with the outline of California filled with endless palm trees. Oh boy, I thought, Someone’s never been to San Francisco before. Pizza was not invented in Chicago, Illinois…just perfected there. Wow, I can’t wait to leave Afghanistan and return to the USA! Apparently Nashville was confused with New Orleans… just kidding… sort of. When I was in the UK in the early ’80’s, I found that just about every person I met thought of the Midwest as a massive corn field with Chicago plopped down in the middle of it. (And more than a few people mimicked the “rat-tat-tat” of a tommy gun when they said Chicago.) The few exceptions I met said “Harley-Davidson!” when I mentioned my hometown. Certainly not beer or cheese – given the excellence of native Brit brews and cheeses, they do not automatically think of America when they think of those products. Bawer is right. Euros flatter themselves that they “know” America, but what they know are Hollywood stereotypes. Most Euros visit NYC, LA and Disney World if they visit the States and ignore “flyover country” entirely. A trip spent in Manhattan and Magic Kingdom really doesn’t make you an authority on the States, anymore than a few days spent visiting the Louvre and Notre Dame gives you any great insight into modern-day French folk. We (catholics) must be strong in these times.